Annabel Beam was only 9-years-old when she fell down a hollowed-out tree and landed on her skull. Despite other horror stories in which spines were snapped and skulls were broken, Annabel emerged with a few scratches and a miracle: She was cured of a lifelong illness. Annabel Beam shares story of how God cured her of lifelong illness (PA Real Life). LOS ANGELES, CA (Catholic Online) - After firefighters spent hours removing her from the tree, Annabel told her family that she went to Heaven and met Jesus, who healed her. Annabel's mother, Christy, opened up about her daughter's illness and how doctors struggled to care for the symptoms of pseudo-obstruction motility disorder, which is an incurable condition that had plagued Annabel her entire life. In the hospital following her accident, Annabel's doctors ran MRI and CT scans and were amazed to see her skull and brain were intact and had not sustained any major injuries. Further tests revealed Annabel was cured. "Heaven was very bright and it was very peaceful," Annabel recalled. "There was no pain, and that's why I wanted to stay. And I sat on Jesus' lap and I asked Him if I could stay. "He said, 'No, Annabel, I have plans for you on Earth that you cannot complete in heaven, but whenever the firefighters get you out, there will be nothing wrong with you." 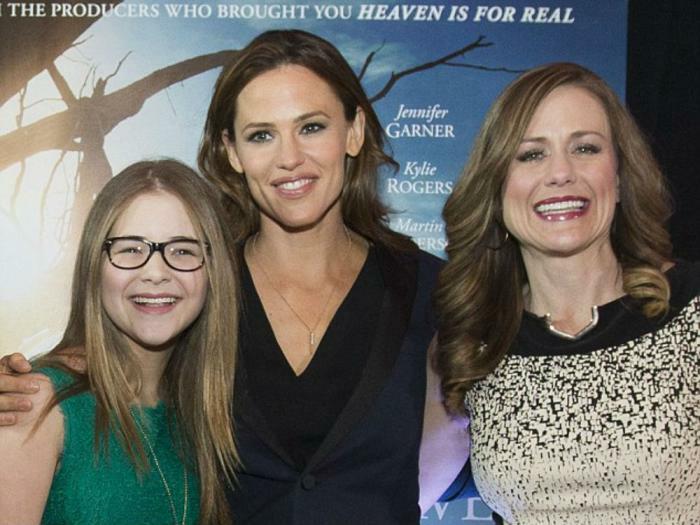 Jennifer Garner plays Annabel's mother in the film based on the child's miracle healing (Getty Images). When asked what Jesus looked like, Annabel described him as having brown hair, a beard and he wore a purple sash. Sure enough, when Annabel awoke, she was so healthy that the painkillers prescribed for possible discomfort were left entirely untouched as Annabel was perfectly fine. Annabel's story was so amazing that her mother, Christy Beam, wrote a book to spread God's continued miracles. When actress Jennifer Garner approached Beam after being cast as Christy for the film version, Beam explained "she had my book. She had read the book from cover to cover, and she'd underlined and highlighted and dog-eared. She's really sweet." Garner spent time with the Beams to promote the film and get a better understanding of Christy's character. Garner even hailed Christy as an inspirational character, stating: "I was definitely inspired by who Christy is as a mom." Following the filming of "Miracles from Heaven," Garner admitted it inspired her to return to church, which in turn inspired her children as well.